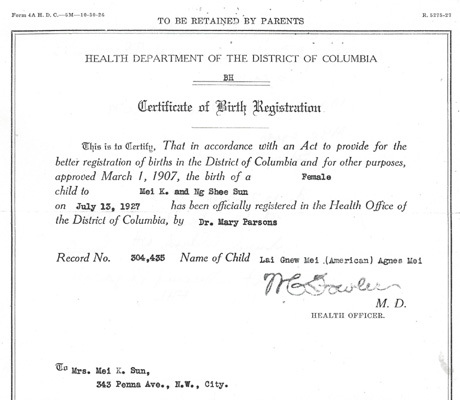 Mei Lai Gay (Agnes) – Washington D.C.
“Mei Lai Gay (Agnes), Form 430 photo and birth registration” 1927, Chinese Exclusion Act case files, RG 85, National Archives-Seattle, Mei Lai Gay (Agnes) case file, Seattle Box 817,file 7030/13284. 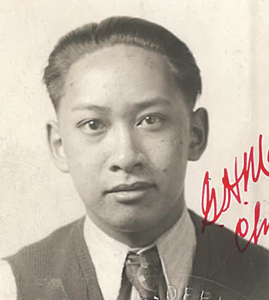 The father of Mei Lai Gay (Agnes), Mei (Moy) Kong Kay (marriage name: Mei (Moy) Kung Sun) first came to the United States in 1908 and was admitted as a merchant at the Port of San Francisco. He was born in 1882 in Sai Yuen village, On Fun section, Hoy San district, China. He and his wife, Ng Shee, had six children; two sons living in China and four in D.C. where they had been living since 1923. Mei Kung Sun was a merchant at Hong High Company, 343 Pennsylvania Avenue NW, Washington, D.C.
Agnes’ 1927 birth was registered by Dr. Mary Parsons. Dr. Parsons had been practicing medicine in D.C. for fifty-three years and had worked with the Chinese population for 31 years. It was thought that she officiated at the birth of the first Chinese baby born in the city. 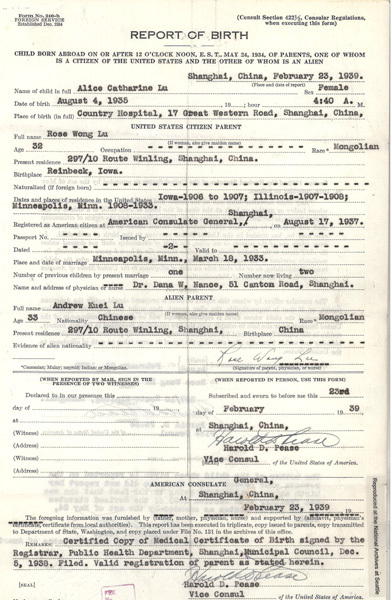 The return certificates as American citizen applications for the parents, Agnes, her two brothers and sister were approved and they left Washington, D.C. for China in 1927. In October 1940 Mei Lai Gay Agnes and her sister Mei Bow Ngook Ruby returned to the U.S. through the Port of Seattle. They were going to live with their brother, Mei (Moy) Bow Duen Earnest, in Washington, D.C. The interrogators questioned Ruby, age 16, then Agnes, age 13. Their father, Mei (Moy) Kung Sun, died in the U.S. in 1938. Their mother moved from her husband’s home village to Hong Kong after her husband’s death. 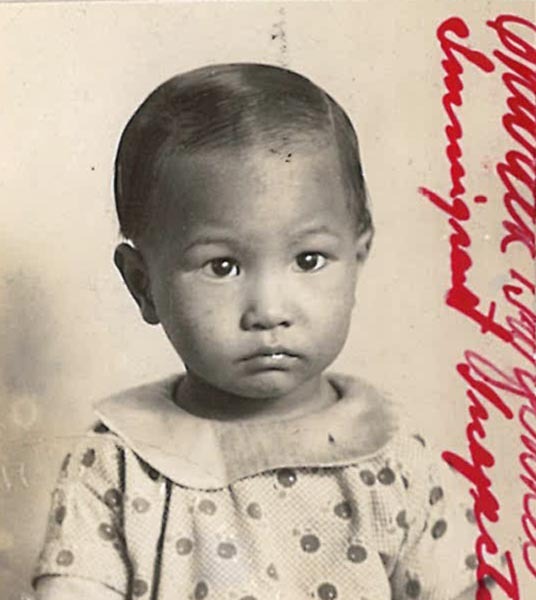 The examining inspector had no questions about the identity of Ruby and noted after careful examination of the photograph of Lai Gay Agnes that “the left ear of this applicant shows outer and inner rim close together and a ridge in the center of the right ear.” [Evidently this scrutiny of her left ear agreed with her baby photo.] 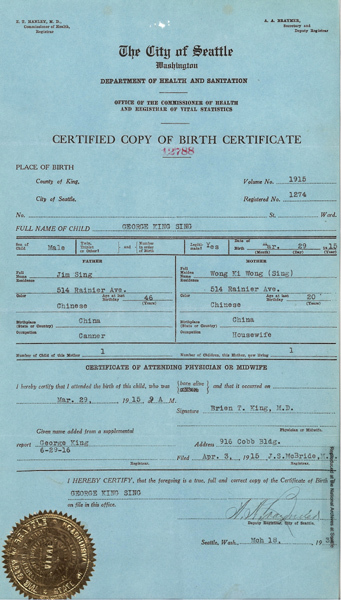 Their applications were approved and they were admitted into the U.S.
“Mei Lai Gay (Agnes) M143 photo,” 1940, Chinese Exclusion Act case files, RG 85, National Archives-Seattle, Mei Lai Gay (Agnes) case file, Seattle Box 817,file 7030/13284. The Reference Sheet in Mei Lai Gay (Agnes Mei)’s file includes the name, relationship and file number for Agnes’ parents, four brothers and her sister. “Photo of Mrs. Moy Chuck Poy (Woo Shee) and family,” 1940, Chinese Exclusion Act case files, RG 85, National Archives-Seattle, Moy Mee Ting (Georgia Moy) case file, Seattle Box 737, 7030/10320. Moy Mee Ting 梅美清 (Georgia Moy) and her bother Moy Fang Dhl 梅宏資 (Stanley Moy) were admitted to the U. S. at the Port of Seattle on 3 September 1937 as native born U. S. citizens. Georgia was 14 years old and Stanley was a year younger. They were joining their father, Moy Chuck Poy in Chicago, Illinois. Their native dialect was See Yip Sun Ning. 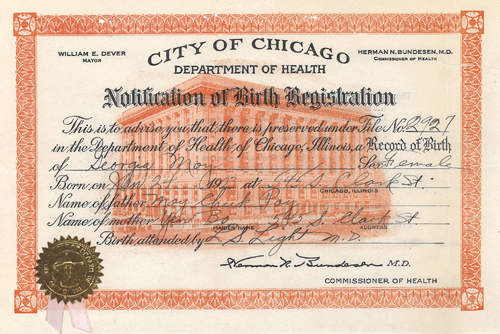 Chicago, Illinois birth registration, Georgia Moy, 1923; Chinese Exclusion Act case files, RG 85, National Archives-Seattle, Moy Mee Ting (Georgia Moy) case file, Seattle Box 737, 7030/10320. The Moy family went to Sai How Gow Dee village, China in 1927 so the children could study Chinese. The children Georgia, Stanley, and Philip (Moy Mon Dle) were all born in Chicago. 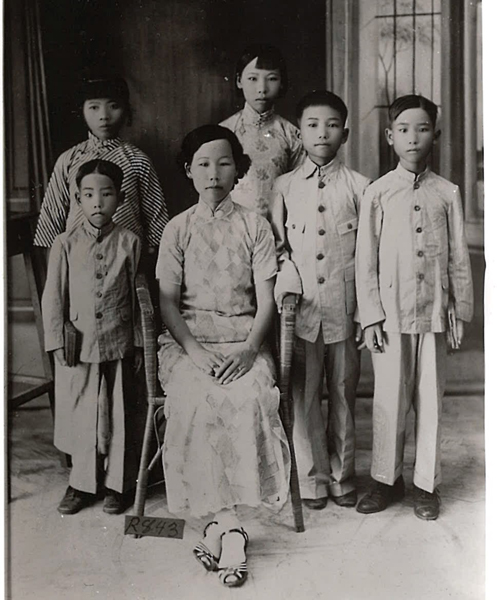 Their mother Woo Shee (maiden name: Woo Yin Po) stayed in China and their father returned to the U. S. about 1929. The children and their mother moved to Ng Gong market near Gow Dee village in about 1932 because there were many floods in their former village. 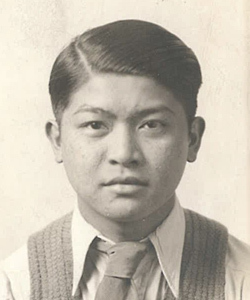 Moy Mee Ting’s paternal grandfather, Moy Fang Chung (marriage name: Moy Dip Nai), was living in Detroit in 1937. Moy Mee Ting testified that Sai How Gow Dee village had over 100 houses and she attended the Sai How School. There were over 100 students and including about thirty or forty girls. There were no women teachers. In her interview she was asked about size of the village, the number of stores, the number of stories of various buildings, who lived where, where they got their household water, how their house was lighted, where everyone slept, the number of beds, who cut her hair, why her mother had a servant girl, and many more questions. When they moved to Ng Gong market the children attended the gospel mission school called Jing Ock. They had women teachers at this school. Chairman Inspector J. H. Gee asked Mee Ting several questions about where her mother got the money to support them after her father returned to the U.S. and where she got the white gold wrist watch she was wearing. She replied that her father had been sending her mother money and her mother gave her the watch before she left for the U.S.
Their mother accompanied them to Hong Kong. They took a boat from Ng Gong market to Ow San market, a train to Bok Gai and a steamer to Hong Kong. Their mother said goodbye onboard and a man named Chin Deung Fun oversaw them on the trip to the U.S. The Immigration committee reviewed the parents’ files from 1917 and 1921 and the family’s files from when they left the country in 1927 and voluminous current testimony and unanimously approved the admittance of Moy Mee Ting and Moy Fang Dhl. 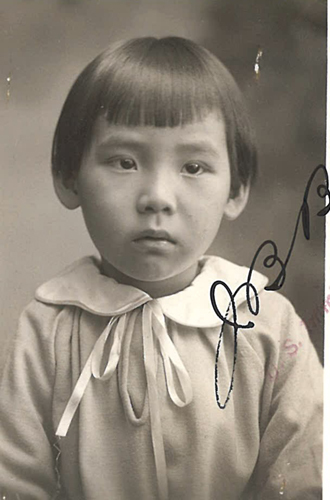 “Form 430 Photo of Moy Mee Ting (Georgia Moy),” 1927, Chinese Exclusion Act case files, RG 85, National Archives-Seattle, Moy Mee Ting (Georgia Moy) case file, Seattle Box 737, 7030/10320. “Photos of George and James Mar, Form 430,” 1932, Chinese Exclusion Act case files, RG 85, National Archives-Seattle, Mar King Sing (George King Sing) and Mar Jim Sing (James Mar) case files, Seattle Box 538, 7030/3747 and 7030/3748. George and James Mar – brothers of Roy Sing Mar, DDS (1927-2018) and Ruby Mar Chow (1920-2008), owner of Ruby Chow Restaurant and first Asian American elected to Seattle King County Council in 1973. Mar King Sing 馬日勝 (Chinese name Mar Yet Sing) was the eldest son of Mar June (Jim Sing) and Wong Shee黃氏; (黃)巧云 . They had ten children; all born in Seattle, WA: George Mar, Jim Sing Mar, William Mar, Ruby Mar, Mary Mar, Alice Mar, Henry Mar, Roy Mar, Edwin Mar, Coleman Mar. George Mar was born on 19 February 1915 but his birth certificate incorrectly states that he was born on 29 March 1915. He was applying for his citizen’s return certificate so he could be employed by the Dollar Steamship Line on their steamers to the Orient. James Mar (Mar Jim Sing), George’s younger brother, was born 29 May 1916. He presented his Seattle birth certificate #12786 as evidence of his citizenship. He was applying for employment with American Mail Line and hoping to go to China with the company. When they applied their father was visiting China and their mother, home in Seattle, was a witness for both of her sons. Their Form 430, Application of Alleged American Citizen of the Chinese Race for Pre-investigation of Status, was approved. They visited their father in Hong Kong and returned to Seattle on the S.S. President Taft on 12 July 1932. Their brother Roy S. Mar, DDS, died in Seattle on 14 March 2018. According to his obituary in the Seattle Times, 25 March 2018, page B4, Mar served in the U.S. Navy and became the first Chinese American to graduate from the University of Washington Dental School. Their sister, Ruby married Edward Shue Ping Chow. They established the celebrated Ruby Chow’s restaurant in Seattle in 1948. Ruby helped create the Wing Luke Museum and became the first Asian American elected to the King County Council in 1973. She died in 2008. See Seattletimes.com, seattlepi.com, HistoryLink.org, Wikipedia.org for more information on Ruby Chow. Rose Wong, daughter of Gee “George” Wong and Minnie Lee Wong, was born 3 June 1906 at Reinbeck, Iowa. She married Andrew Kuei Lu on 18 March 1933 in Minneapolis, Minnesota. Lu was a Chinese citizen in the United States with a Section 6 student exemption. Kuei Lu and Rose Wong Lu returned to China in February 1934. Their son Thomas Laurence was born three months later on 20 May 1934 in Shanghai. Alice Catherine Lu was born the next year on 4 August 1935. In April 1939 Rose and her two children returned to the U.S. through Seattle. They were here to visit Rose’s parents in Minneapolis and would return to China sometime after Christmas. Rose obtained her certificate of identity 79613 when she landed in Seattle. Thomas was considered a temporary visitor when he entered the U.S. His stay could not exceed one year. He was born four days before the Tydings-McDuffie Act of 24 May 1934 went into effect. The Act would have allowed him to be considered a U.S. citizen if he had been born after 24 May 1934. He missed being considered a citizen by four days. His mother and little sister were citizens. 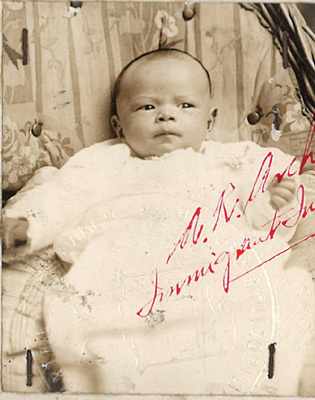 Mrs. Rose Wong Lu obtained a Report of Birth for Lu Alice Catherine issued by the American Consulate at Shanghai and presented it to Immigration upon their arrival in 1939. “Lu Alice Catherine, Report of Birth, Shanghai, China,” 1935, Chinese Exclusion Act case files, RG 85, National Archives-Seattle, Lu Alice Catherine case file, Seattle Box 784, 7030/11928. “Lu Alice Catherine, Form 430 photo,” 1940, Chinese Exclusion Act case files, RG 85, National Archives-Seattle, Lu Alice Catherine case file, Seattle Box 784, 7030/11928. O. B. Holton, District Director of the St. Paul District Immigration Service noted that the signatures in Chinese on Forms 430 were omitted because Rose Wong Lu, the applicant’s mother, was unable to write Chinese. Rose Wong Lu, her daughter Alice Catherine Lu; and her son, Hou Chi Thomas Lawrence Lu (Seattle file 7027/819), visited with family in Minneapolis and were approved to leave the United States in April 1940. They left for China from Vancouver, B.C., via Seattle, on the Empress of Asia on 20 April 1940. Ng Chuen Yong (吳春容) was twelve years old in July 1939. She passed a medical examination in Hong Kong before boarding the Princess Marguerite for her return trip to the United States. 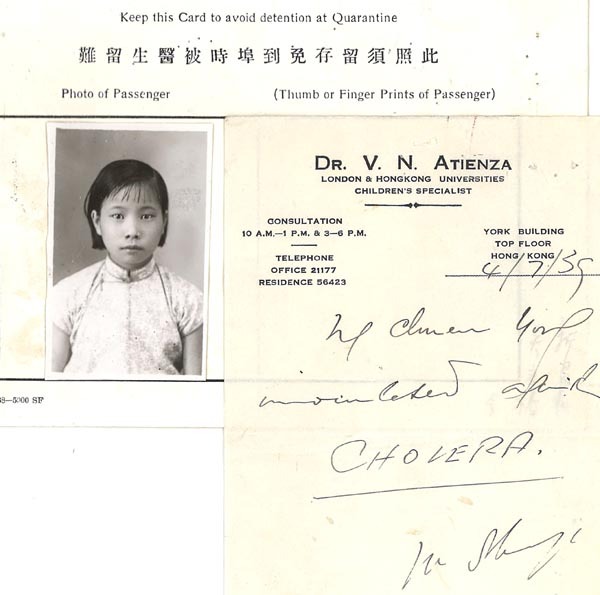 “Medical Card for Ng Chuen Yong,” 1939, Chinese Exclusion Act case files, RG 85, National Archives-Seattle, Ng Chuen Yong case file, Seattle Box 792, 7030/12239. 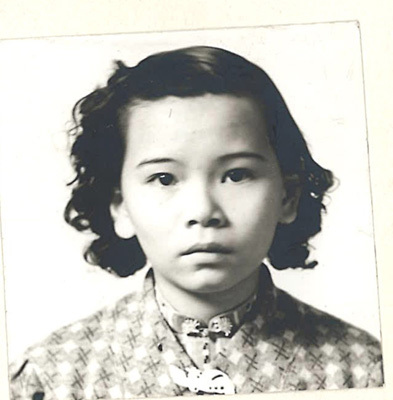 Ten years earlier she and her mother, two brothers, Ng Chuck Sang and Ng Jack Sang, and sister, Ng Chuen Moy had left from the port of Seattle to return to their home village of Nom Yung in Hoy Ping District, China. There were only two houses in the village and they were next door to her mother’s parents. Her mother and brother, Jit [Jack] Sang traveled back to the United States about 1931; her brother Chuck Sang returned around 1937. Her sister stayed in China and was going to school in Hong Kong. “Ng Chuen Yong, Form 430 Photo” 1929, Chinese Exclusion Act case files, RG 85, National Archives-Seattle, Ng Chuen Yong case file, Seattle Box 792, 7030/12239. Ng Chuen Yong’s mother, Lee Lon, was born in China and was admitted to the U.S. at the port of San Francisco, California in 1923 as the daughter of a merchant. Her husband, Ng Ong Jen, was born in San Francisco. They were married in July 1924 in Pittsburgh, Pennsylvania. He was a waiter there at the Paris Inn Restaurant. Their children were all born in Pennsylvania. 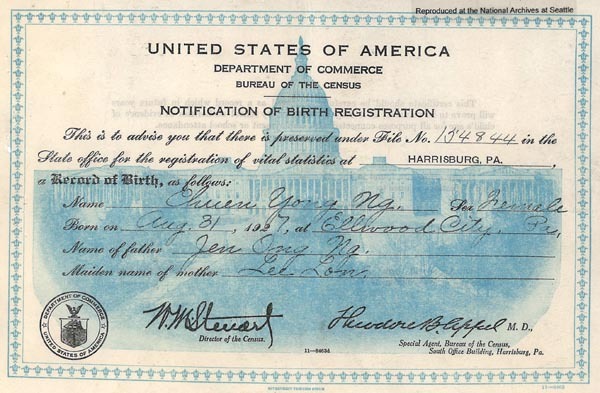 The United States Department of Commerce, Bureau of the Census issued a “Notification of Birth Registration” for Ng Chuen Yong saying she was born on 31 August 1927 at Ellwood City, Pa. 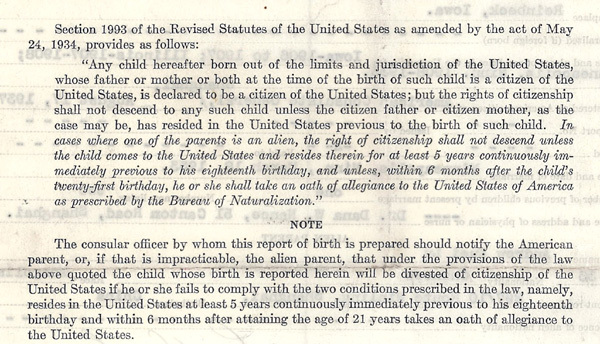 The document was signed by Dr. Theodore B. Appel, Harrisburg, Pa.
“Notification of Birth Registration” 1927, Chinese Exclusion Act case files, RG 85, National Archives-Seattle, Ng Chuen Yong case file, Seattle Box 792, 7030/12239. Ng Chuen Yong was admitted in 1939.